February 8th 2013. As chaos ensues in Tunisia, a small North African country wedged between the Mediterranean Sea and the Sahara Desert, and conflicts arise between the Islamist government and a mass of citizens who would have preferred that the Islamist party had not won the democratic election, it is worth stepping back to look at this corner of the world apart from the current issues. While the country is stuffed between Algeria to the West and South and Libya to the East and South, it should be noted that it is only a matter of a short one hundred mile sail across the sea to Sicily. There is not much that is particularly African about Tunisia, except it is perched at the top of the massive continent. But this article is not about unrest, or politics, or culture, or Islamists or the desert, or the German tourists who used to crowd here each summer. No, nothing as serious as that. It is time to think about a Dizzy Gillespie tune, A Night in Tunisia. One of the best tunes ever written in any genre of music, this example of American genius is the epitome of classic jazz perfection. So while I worry for the safety of Tunisian citizens as thousands shout, chant, fight and start fires, if I have to be honest, I cannot hear the name Tunisia without that tune filling my head. And so as I write this I have typed A Night in Tunisia into the search box on Spotify and am playing one version after the other, Dizzy Gillespie, Dexter Gordon, Art Blakey, Coleman Hawkins, Charlie Parker, Miles Davis, Freddie Hubbard, Arturo Sandoval, Lee Morgan, Ella Fitzgerald, Bud Powell, Sonny Rollins, McCoy Tyner, and more, and more. Everyone has taken a stab at it. 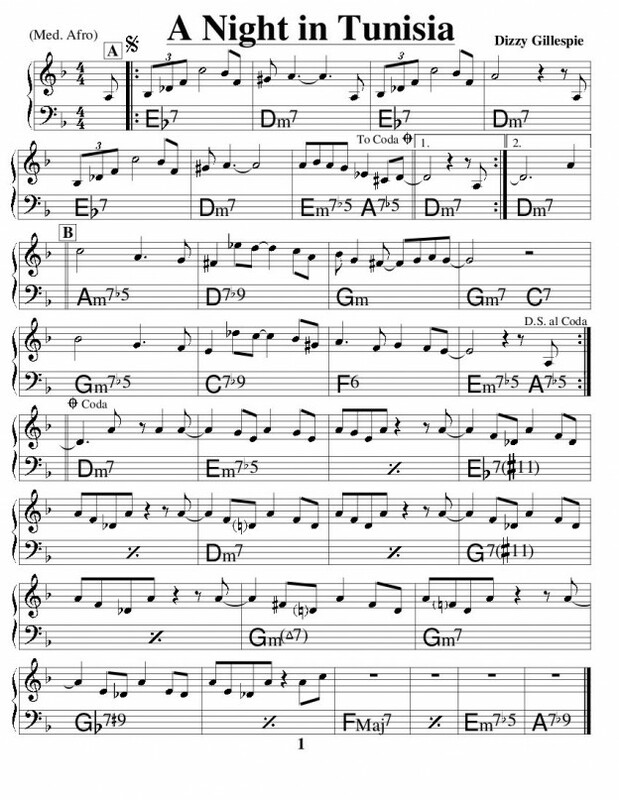 The solos are different, the tempos are different, the orchestration changes, but that tune is always there, and it is one of those melodies that works like the human brain, and that is why everyone can hear it and feel moved by that exciting sequence of notes. From Gillespie’s brain to our brains, it just fits the patterns that underly our thought processes. How does the brain work? A Night in Tunisia, that’s how. That’s all you need to know about the brain. Sometimes I take a duck call and play this tune on it, and the ducks come in the dozens and just stand there and look at me. Even ducks’ brains work like A Night in Tunisia. Even goldfishes stop what they are doing when this tune comes on. It speaks to their brains too, and they are not as simple as everyone has been taught. Will your baby not stop crying? A Night in Tunisia. Is your horse sick? A Night in Tunisia. This tune takes care of a million problems. And so, I will leave you with a recommendation. Listen to A Night in Tunisia, as many versions as you can cram in. Jeffrey the Barak never eats cheese on the roof on Fridays. 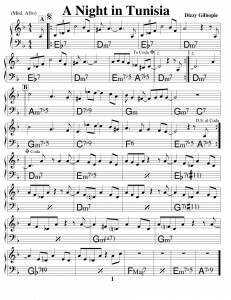 I stumbled into this article looking for sheet music on a night in Tunisia. I found the article to be the best I have ever read on any subject. When I read the score for a night in Tunisia attached to this article , I said this is best song I have seen written on paper. I am just learning how to play the piano and i just breezed through this song after about 3 days. Jazz music, I have found, is a great help in getting through the daily grind and ups and downs in life. Again congrats on a great article.